Mosquitoes infected with West Nile virus (WNV) have been detected this week in Canyon and Payette counties, prompting public health officials to remind people to take precautions to fight the bite. The positive mosquitoes are the first detected in the state this year. Wildfire smoke and poor air quality are going to be with us for a while. The people who are most affected by poor air quality are also the most vulnerable: Children, the elderly, the disabled, and people with respiratory and heart conditions. Air quality can fluctuate daily around the state, but it is not expected to significantly improve anytime soon. Please be aware of current conditions and keep children inside when the air quality is unhealthy. Also, check on your elderly and vulnerable neighbors to be sure the air quality is not causing them undue distress. If you coach children or run a daycare or a school, it’s especially important to be aware of outside air conditions. Sending a child with asthma out to play when air quality is listed as orange (unhealthy for sensitive populations) or red (unhealthy for everyone) could lead to serious health effects for that child. You can check real-time air quality in many Idaho communities through the Idaho Department of Environmental Quality’s air monitors here. Smoke from wildfires in Idaho and neighboring states is affecting the air quality in nearly every Idaho community in the northern and southwestern parts of the state, and officials from public health and environmental quality are reminding residents to be aware of the conditions so they can take precautions. 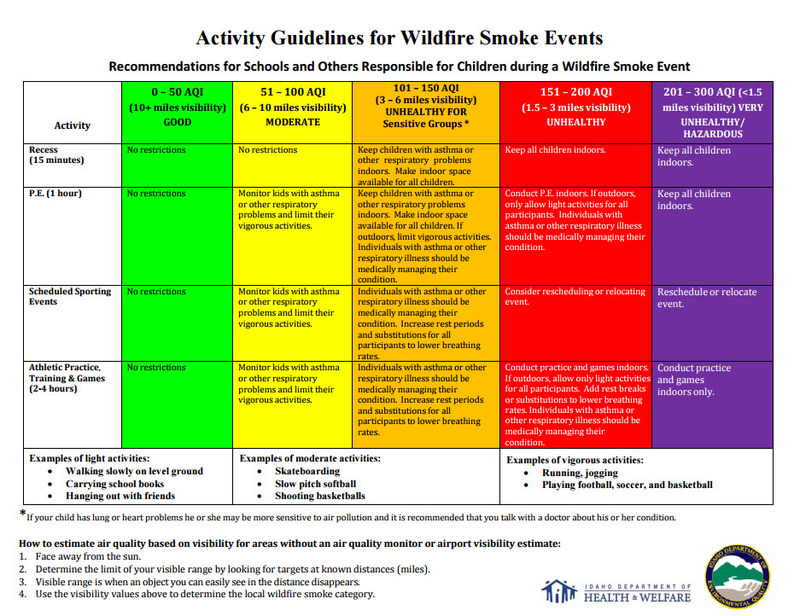 The strongest smoke impacts are currently occurring across the Latah, Nez Perce, Lewis, Clearwater, and Idaho counties, as well as in southwest Idaho and east toward Twin Falls and north toward Garden Valley and McCall. Air quality is ranging from moderate to unhealthy across these areas, and impacts are from ongoing fires burning in Oregon, Washington and California, and a multitude of local fires that started this week.